If you are interested in looking at the challenged ballots, the Minneapolis Star Tribune has provided a sample of 599 ballots here. I have gone through 100 of them and I would guess that it would be lucky if 10 percent involve really difficult calls. With 5,623 challenged ballots (about equally divided between Coleman and Franken), a 10 percent rate means 562 ballots. Suppose that Coleman losses all his challenges and Franken wins all his and that the 562 are equally divided between the two sides, that would appear to be a pick up of 281 votes for Franken. Right now Coleman is up by 282 votes. The Star Tribune analysis showed that Franken could win the election by 26 votes by prevailing on 7 percent of his challenges of Coleman votes, provided that Coleman won none of his challenges of Franken votes. Franken would have to climb a higher hill if Coleman were to win some of his challenges. If the incumbent won as few as 5 percent of his challenges of Franken votes, Franken would need to win more than 11 percent of his. . . .
Did Blacks and Hispanics defeat California's Proposition 8? Some claim that blacks probably didn't tip the balance in the vote on California's proposition 8. Others have made similar statements that because of the unusually high turnout among blacks, blacks and Hispanics as a whole made the difference for Proposition 8. 13,084,570 people voted on proposition 8. The initiative won 6,838,107 to 6,246,463, a difference of 591,644 votes. 10 percent of the voters were black (6% black women and 4% black men) and 70 percent of them voted for the proposition. That implies that blacks supplied a net vote in favor of the initiative of 523,383. Blacks by themselves made up 88 percent of the margin by which the initiative won. Hispanics made up 18 percent of the voters and voted for the initiative by 53 to 47 percent. That implies that Hispanics supplied a net 141,313 votes in favor of the initiative. Minorities supplied a net total of 664,696 votes for the proposition, 12 percent more than was necessary to get it passed. The initiative was clearly passed by black and Hispanic voters. The black support for Proposition 8 appears to have been larger than for any other group, even just 61 percent of those 65 and older supported the proposition. Next question is whether the large turnout for Obama among minorities made a difference. Historically blacks made up 6 to 7 percent of voters in California and Hispanics about 13 percent. Suppose blacks had made up 6 percent of the turnout this election. That would have reduced the net vote by blacks in favor of the initiative to 314,030. For Hispanics, it would have reduced their net vote to 102,059. A net gain for Proposition 8 of 416,089 votes, about 63 percent of what they contributed. Blacks and Hispanics would have made the difference even if they hadn't turned out in record numbers, but the win margin for the proposition would have been reduced by almost 250,000 votes. But what angered Mr D'Souza almost as much were the masses of armed police hiding in the area who simply refused to shoot back. "There were armed policemen hiding all around the station but none of them did anything," he said. "At one point, I ran up to them and told them to use their weapons. I said, 'Shoot them, they're sitting ducks!' but they just didn't shoot back." . . .
CHICAGO (AP) - The nation's retailers got a much-needed sales boost during Black Friday's traditional shopathon as consumers, lured by deep discounts, spent nearly 3 percent more than they did last year. Sales on the day after Thanksgiving rose to $10.6 billion, according to preliminary figures released Saturday by ShopperTrak RCT Corp., a Chicago-based research firm that tracks sales at more than 50,000 retail outlets. Last year, shoppers spent about $10.3 billion on the day after Thanksgiving, dubbed Black Friday because it was historically the sales-packed day when retailers would become profitable for the year. While it isn't a predictor of overall holiday season sales, Black Friday is an important barometer of people's willingness to spend during the holidays. Last year, it was the biggest sales generator of the season. Not content to let things rest there, the article insists on still painting a potentially gloomy picture. But experts caution that this year's sales growth may be hard to sustain for the remainder of the holiday shopping season, which has 27 days between Thanksgiving and Christmas instead of the 32 last year. . . . The councilman says his question is: who takes a loaded gun into a toy store. And his answer is: "I doubt it was the casual holiday shopper." Authorities are still investigating but indicate the shooting may have been gang related. Note that this attack occurred in California where the ability to get a concealed handgun permit is extremely difficult. "Obama’s Fundraising and the Small Donor Myth"
Barack Obama got his campaign money through tapping a huge small-donor network, right? Mmm, maybe not. The Campaign Finance Institute released a new study that tallied "small donors," whose repeated contributions made them medium- or large-size donors. And the study—partially—punctures the myth of the small Obama donor. And it leaves a couple of questions unanswered. . . . . But the study also shows that the percentage of donors giving a total of less than $200 was not dramatically different from that of McCain, Bush, or Kerry. Obama distinguished himself in the medium- and large-donor categories. Donors totaling $201-$999 accounted for 27 percent of Obama donors (McCain: 20 percent, Kerry: 24 percent, Bush: 13 percent) and donors giving a total of $1,000 or more made up 47 percent of Obama's patrons (McCain: 59 percent, Kerry: 56 percent, Bush: 60 percent).So, good for him in that regard. . . . . The Campaign Finance Institute report can be found here. Drug companies are blocking or delaying the entry of cheaper generic medicines into the EU, pushing up medicine bills, the European Commission has said. Their actions cost EU healthcare providers 3bn euros ($3.9bn; £2.5bn) in savings between 2000 and 2007, it said. It added that drug firms used legal action and multiple patents to stop rivals getting to market. Drug firms said the "perfectly lawful" measures were justified to protect investment in research and development. . . . I confess that I know little about the gun control regulations in India so I can't verify much of this. Extraordinary details of the heavy-handed police operation against Shadow Immigration Minister Damian Green were revealed this afternoon. Nine counter-terrorism officers raided the MP's London home, frightening his 15-year-old daughter Verity and wife Alicia who were there. Mr Green was seized at his constituency home in Ashford, Kent, and held at Belgravia police station for nine hours, only one of which was used to question him about his alleged crime - leaking information embarrassing to the Home Office. . .
By contrast, however, the molehunt at the Home Office was for the source of a stream of stories that embarrassed the Government rather than threatened national security. They included that 5,000 illegal migrants had been cleared to work in security. Last week a junior Home Office official, aged 26, was arrested. Tory leader David Cameron said police and ministers had 'serious questions' to answer, particularly about the use of counter-terrorism officers. . . . . However, Mr Cameron, London mayor Boris Johnson, and Commons Speaker Michael Martin were all given prior notice. Former Conservative Home Secretary and Tory leader, Michael Howard, said he would be "astonished" if he had not been told about the police investigation when in office. . . .
no ministers were told about the raids in advance. Why tell "Mr Cameron, London mayor Boris Johnson, and Commons Speaker Michael Martin" but not anyone in the Labor leadership? Anyway, there are some questions here that will have to be ironed out. Results of the poll were released this week in advance of the start of a major international conference in Poland where delegates are considering steps toward a new international climate-change treaty to replace the Kyoto Protocol, which expires in 2012. There already are reports emerging that some countries, such as coal-dependent Poland, are pushing for special treatment to avoid making major commitments to slash carbon emissions during a global economic downturn. Less than half of those surveyed, or 47 per cent, said they were prepared to make personal lifestyle changes to reduce carbon emissions, down from 58 per cent last year. Only 37 per cent said they were willing to spend "extra time" on the effort, an eight-point drop. And only one in five respondents - or 20 per cent - said they'd spend extra money to reduce climate change. That's down from 28 per cent a year ago. The Canadian results, from a poll of 1,000 respondents conducted in September, were virtually identical to the overall figures. There are no comparative figures for Canada because Canadians weren't included in the global study in 2007. The 11 countries surveyed were Australia, Brazil, Canada, China, France, Germany, India, Malaysia, Mexico, the United Kingdom and the United States. There were 2,000 respondents surveyed in China, including 1,000 in Hong Kong. . . .
Tim Herbert of the Consumer Electronics Association predicts a paltry 3.5 percent growth in consumer electronic purchasing for fourth-quarter 2008, compared to a 7 percent growth last year. . . .
ST. PAUL, Minn. - Minnesota's U.S. Senate showdown is veering down a path toward the courts and possibly the Senate itself after a panel's ruling on rejected absentee ballots dealt a blow to Democrat Al Franken's chances. For the first time, his campaign on Wednesday openly discussed mounting challenges after the hand recount involving Franken and Republican Sen. Norm Coleman concludes. That includes the possibility of drawing the Senate into the fracas. The state Canvassing Board denied Franken's request to factor absentee ballots rejected by poll workers into the recount. He sought to overturn the exclusions in cases where ballots were invalidated over signature problems or other voter errors. Coleman's campaign maintained the board lacked power to revisit those ballots. Franken entered the recount trailing Coleman by 215 votes out of 2.9 million ballots. As of Wednesday night, Coleman was up 292 votes, including results from Nov. 4 and recounted ones. All told, 86 percent of the ballots have been recounted. However, about 4,740 ballots have been challenged by the two campaigns that could fall to the canvassing board to rule on. The ruling wasn't a complete victory for Coleman. The board left open the possibility of examining ballots that were set aside for errors outside of the voter's control. Secretary of State Mark Ritchie estimated that 12,000 absentee ballots were rejected for various reasons — some legitimate, some not. That represents between 4 percent and 5 percent of all the absentee ballots cast. Franken's campaign had made the push to factor in rejected absentee ballots key to its recount strategy, even going to court to force county officials to turn over data on voters whose ballots didn't count. Marc Elias, the legal chief for Franken, said the campaign won't appeal the board's ruling but it could seek intervention of another kind once the recount wraps up. "Whether it is at the county level, before the Canvassing Board, before the courts or before the United States Senate, we don't know yet. But we remain confident these votes will be counted," Elias said. The board's decision drew a response from the Senate's top Democrat, Majority Leader Harry Reid, who called it a "cause for great concern." . . .
"In the Soviet Union there is freedom of speech. In the United States, there is freedom after speech." "Under capitalism man exploits man. Under communism, it is the other way around." Thanks to a reader for sharing this with me. Cancelled to provide coverage of terrorist attacks in India. Only 0.8 percent of all test-takers scored an "A." America's report card may come as little surprise to fans of Jay Leno's man-on-the-street interviews, which reveal that most people don't know diddly about doohickey. Still, it's disheartening in the wake of a populist-driven election celebrating joes-of-all-trades to be reminded that the voting public is dumber than ever. The multiple-choice ISI quiz wouldn't deepen the creases in most brains, but the questions do require a basic knowledge of how the U.S.
government works. Think fast: In what document do the words "government of the people, by the people, for the people" appear? More than twice as many people (56 percent) knew that Paula Abdul was a judge on "American Idol"
than knew that those words come from Lincoln's Gettysburg Address (21 percent). In good news, more than 80 percent of college graduates gave correct answers about Susan B. Anthony, the identity of the commander in chief of the U.S. military, and the content of Martin Luther King Jr.'s "I Have a Dream" speech. But don't pop the cork yet. Only 17 percent of college grads understood the difference between free markets and centralized planning. Then again, we can't blame the children for what they haven't been taught. Civics courses, once a staple of junior and high school education, are no longer considered important in our quantitative, leave-no-child-behind world. And college adds little civic knowledge, the ISI study found. The average grade for those holding a bachelor's degree was just 57 percent -- only 13 points higher than the average score of those with only a high school diploma. Forty-three percent didn't know what the Electoral College does. And 46 percent didn't know that the Constitution gives Congress power to declare war. . . .
Government bailout would continue paying "Laid-Off Workers to Do Nothing"
A second bankruptcy law expert, George Mason University Professor Todd Zywicki, said, "This is exactly the sort of thing bankruptcy is useful for ... to get rid of programs that don't do the company any good. "The short answer is, yes, this would put the workers 'out on the street.' The longer answer is that they might also be entitled to some damages or compensation." . . . . The cost of the bailout? I haven't checked this claim yet and I have always doubted how accurate inflation numbers are when you go back more than a couple decades (the measure has some problems even year to year). I would also have done it as a percentage of income and income has grown much faster over time than inflation. Still if this is correct, it is interesting. The poll shows Chambliss leading Martin by three points, 50 to 47 percent, with three percent of respondents undecided. The first-term GOP senator's lead is within the poll’s four-point margin of error. . . .
“This thing’s going to be a nailbiter. We don’t know who’s going to turn out and we don’t know how it’s going to turn out, but it’s going to be a close race,” said InsiderAdvantage CEO Matt Towery . . .
Towery said the race was close enough that if Obama appeared at a rally just before the election and urged his supporters to vote for Martin, it might be enough to put the Democrat over the top. “This whole race is on Barack Obama’s shoulders,” said Towery. “If he wants Georgia to vote Democratic, he could come down here the day of the election, hold a rally in Atlanta and get prepared to send people to the polls.” . . . When jobs and the "environment" clash: "Brazil mob attacks environmental police in Amazon"
BRASILIA, Brazil (AP) - A mob of about 3,000 people enraged by a crackdown on illegal logging trashed a government office in a remote jungle city and tried to attack environmental workers, authorities said Monday. Environment Minister Carlos Minc said federal police should be sent to the northeastern town of Paragominas following the riot, which was prompted by the seizure of 400 cubic meters (14,124 cubic feet) of wood believed to have been cut inside an Indian reservation. Many residents of the Amazon deeply resent—and sometimes attack—environmental officials who try to block logging that provides income for rich and poor alike. The mob invaded the offices of the Ibama environmental protection agency on Sunday, destroying furniture and burning important paperwork, Minc said. Then they allegedly used a tractor to try to invade a hotel where Ibama workers were staying, but were repelled with tear gas by police. Minc's ministry said no one was injured. Paragominas is about 150 kilometers (90 miles) from the small city of Tailandia, where a mob of 2,000 rioted over wood seizures in February, forcing environmental authorities to leave the city for days. . . .
Andrew Breitbart explains what is happening to those who donated to Proposition 8 in California here. Why should non-obese passengers have to subsidize obese ones? Lower prices for obese passengers mean that other passengers have to make up for the difference. The Canadian Supreme Court thinks that this is a good idea. I like to have two seats rather than one (I may not be obese, but I do work on planes and it is so much better to be able to spread out my work). As with many court cases, this simply means that there will be more court cases to figure out all the ambiguities in this decision: "What is morbidly obese? How are we going to be able to make that determination and implement that respectfully, and consistently and fairly?" DETROIT LAKES — The math didn’t add up during the first day of the U.S. Senate recount in Becker County on Monday. In addition to 61 ballots that weren’t counted on Election Day on Nov. 4, there were four less ballots counted from Holmesville Township during the recount than was reflected on Election Day. “It’s a very unfortunate situation,” Becker County Auditor-Treasurer Ryan Tangen said. He said that the ballots were overlooked and not transferred to the counting area on election night. They did arrive at the county courthouse by 8 p.m., Tangen said. Fifty-three of the ballots came from mail-in precincts and eight were absentee ballots. Those missing ballots, if allowed to stand, will play a huge part in a race in which 215 votes separate Norm Coleman and Al Franken. Coleman carried Becker County by 2,400 votes in the original count. Tangen said that the advice given to him by the Becker County Attorney’s and the Minnesota Secretary of State’s offices were to count the 61 ballots. . . .
Might some women be avoiding getting concealed handgun permits because they don't want to be in classes with men? I hadn't really thought that this could be a problem. Faith Ferkel has found a universal concern among Ohio women who want to use firearms to protect themselves. Many of the women who would like to obtain a concealed weapon permit are intimidated by the thought of taking the state's mandatory Basic Pistol course with a room full of men. The NRA certified instructor from Fremont, Ohio, came up with a simple solution when she teamed up with her mother to teach all-ladies pistol courses. Faith and her mom, Joy Ferkel, an adjunct instructor of English and Communications at a local community college, have sparked an idea that is bringing many local women into the firearms circle. There are no male teachers and no male students in their classes, just a relaxed feminine atmosphere that creates a comfortable place to learn. While the students didn't all have the same reason for wanting to learn how to handle a gun, they all chose the Ferkels' class for the same reason: there were no men. "I probably wouldn't have come if it wasn't an all-girls class," said Rhonda Soper, a legal secretary from Clyde. . . . Politicians pose as the ultimate experts. They may never have worked in an industry or studied an issue before, but after few months of time on a topic they know everything: the types of cars that should be produced, the science of global warming, and how much doctors should charge for different types of surgery. Few in congress even have backgrounds that are closely related to some of the issues covered by government. Just take the Senate this year, where almost half, 45, are attorneys. Only one doctor, four farmers, 13 business people, seven teachers, four professors (all law and three are listed as just adjuncts), and virtually everyone else lists their past experience as professional politician. No members of the Senate are scientists or economists. One member of the Senate played professional sports and another owned a professional sports team. A president and members of Congress deal with thousands of complicated topics each year. But is there anything politicians consider anything off limits? "I think any sensible person would say that, if you've got a bunch of teams who play throughout the season and many of them have one loss or two losses, there's no clear, decisive winner, that we should be creating a playoff system. Eight teams, that would be three rounds to determine a national champion. It would -- it would add three extra weeks to the season. You could trim back on the regular season. I don't know any serious fan of college football who has disagreed with me on this. So I'm going to throw my weight around a little bit. I think it's the right thing to do." 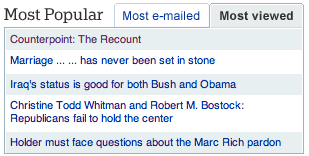 The numbers in the headline are as of 2:02 PM this afternoon CST. The Star Tribune has a very useful page here. Pro-Chávez candidates won 17 of the 22 governor’s races at stake. Many of the seats that Mr. Chavez’s supporters did win were in relatively sparsely populated rural states. . . .
An opposition candidate also won in Sucre, a municipality in Caracas with sprawling slums that had been a symbolic bastion of support for Mr. Chávez since he rose to power a decade ago. Particularly here in Caracas, the results were rooted in festering discontent over the government’s inability to lower violent crime as homicides and kidnappings have surged over the past decade, making it one of the world’s deadliest cities. . . .
Ellen Moran is no bland, disinterested policy wonk. She's best known for her work with Democratic special interest groups, including the AFL-CIO, whose anti-Wal-Mart campaign she once spearheaded. That effort, launched in several state legislatures, aimed to enact state laws to force the discount retailer to pay higher wages and assume more health-care expenses for its employees. The AFL-CIO, in effect, wanted to impose by law on Wal-Mart's non-unionized workforce wage and benefit commitments of the sort now breaking the back of Detroit's auto makers -- something the union had failed to achieve through its own organizing efforts at Wal-Mart. The campaign even gained a big success in Maryland, though the health care mandate enacted by the state legislature was ultimately struck down by a court on federalism grounds. Ms. Moran's next big project was a more successful effort to elect pro-choice Democrats to Congress for EMILY's List. This year Democrats picked up a net gain of at least 13 pro-choice members in the House and two in the Senate (and perhaps as many as four, depending on the recount in Minnesota and run-off election in Georgia). The group's biggest success was defeat of Colorado Republican Rep. Marilyn Musgrave, the founder of the Pro-Life Caucus in Congress who had the misfortune of representing a swing-district that included Colorado Springs and parts of the Denver suburbs. By tapping Ms. Moran to be his communications director, Mr. Obama is signaling something about his agenda and about the interest groups he will be relying on to run his administration, strengthen his Congressional majority in 2010 and win his own reelection fight in 2012. . . .
What a mess: "Democrats' Stimulus Plan May Reach $700 Billion"
Facing an increasingly ominous economic outlook, President-elect Barack Obama and other Democrats are rapidly ratcheting up plans for a massive fiscal stimulus program that could total as much as $700 billion over the next two years. That amount, more than the nation has spent over the past six years in Iraq, would rival the sum Congress committed last month to rescuing the country's financial system. It would also be one of the biggest public spending programs aimed at jolting the economy since President Franklin D. Roosevelt's New Deal. Hints of a hefty new spending program began emerging last week. New Jersey Gov. Jon Corzine (D), an Obama adviser, and Harvard economist Lawrence H. Summers, whom Obama has chosen to lead his White House economic team, both raised the possibility of $700 billion in new spending. Yesterday, Obama adviser and former Clinton administration Labor secretary Robert Reich and Sen. Charles E. Schumer (D-N.Y.) also called for spending in the range of $500 billion to $700 billion. . . . The San Francisco Chronicle has this story. It also again shows the problems produced by mandating disclosure of donors names. A supporter of Proposition 8, fed up with what he believed was the gay community's and "liberal media's" refusal to accept the voters' verdict, fired off a letter to the editor. "Please show respect for democracy," he wrote, in a letter we published. What he encountered instead was an utter lack of respect for free speech. Within hours, the intimidation game was on. Because his real name and city were listed - a condition for publication of letters to The Chronicle - opponents of Prop. 8 used Internet search engines to find the letter writer's small business, his Web site (which included the names of his children and dog), his phone number and his clients. And they posted that information in the "Comments" section of SFGate.com - urging, in ugly language, retribution against the author's business and its identified clients. "They're intimidating people that don't have the same beliefs as they do ... so they'll be silenced," he told me last week. "It doesn't bode well for the free-speech process. People are going to have to be pretty damn courageous to speak up about anything. Why would anyone want to go through this?" . . . .
"Blacklists" of donors who contributed to Yes on 8 are circulating on the Internet, and even small-time donors are being confronted. A Palo Alto dentist lost two patients as a result of his $1,000 donation. The artistic director of the California Musical Theatre resigned to spare the organization from a fast-developing boycott. Scott Eckern, the artistic director of the Sacramento theater group and a Mormon, had given $1,000 to Yes on 8. . . . Equally disappointing is the lack of a forceful denunciation from leaders of the honorable cause of bringing marriage equality to California. . . . . Note that the SF Chronicle columnist was disturbed by these attacks. Many cities and communities around the world now try to get on top of anti-social behaviour as a way of deterring crime. But the idea remains a controversial one, not least because it is often difficult to account for other factors that could influence crime reduction, such as changes in poverty levels, housing conditions and sentencing policy—even, some people have argued, the removal of lead from petrol. An experimental test of the “broken windows theory”, as Dr Kelling and his colleague James Wilson later called the idea, is therefore long overdue. And that is what Dr Keizer and his colleagues have provided. . . . I still wish that they had run a correction, but a letter to the editor is still worth something. This letter is largely based on my piece from Fox News last week. The pieces on the Opinion Exchange website ("WSJ numbers don't add up") and in Tim O'Brien's Nov. 13 Blog House column attacking my work on the Minnesota recount were inaccurate. The Star Tribune's claims have been picked up by other media and used by the Franken campaign. Just correcting "typos" in how the votes were recorded reduced incumbent Sen. Norm Coleman's lead from 725 to 206 votes when Minnesota counties certified the votes on Nov. 10. Using the vote totals from Nov. 9, I pointed out that Franken's net gain was huge -- "new votes for Franken from all the precincts is greater than adding together all the changes for all the precincts in the entire state for the presidential, congressional, and state house races combined." A Star Tribune editor claimed "[Lott's] numbers are simply wrong. ... I don't know what statistical calculation Lott was using, but Obama clearly got more from the corrections." The Star Tribune argued that Obama's net gain was 1,121 votes -- much bigger than Franken's, and thus evidence that nothing unusual had occurred in Franken's race. Why the difference? . . . The piece was the most read piece in the Star Tribune's editorial page on Sunday. An update on the ballot recount in MN from SCSU Scholars can be found here. How ignorant were Obama voters? This Zogby poll is very scary. 42.6 percent of Obama supporters believed that Democrats controlled both houses of congress. 28.2 percent of Obama supporters knew that Biden had to quit a previous political campaign because he had plagiarized a speech. 11.6 percent of Obama supporters knew that Obama had said that his policies would likely bankrupt the coal industry and make energy rates skyrocket. These were multiple choice questions, so those surveyed were guaranteed fairly high rates of success if they had simply voted randomly. Note also that 55 percent of those surveyed had graduated college and that over 80 percent had at least some college. This is a very sad statement about the knowledge level of the electorate as well as what people learn from college. 0.5 percent of those interviewed got all twelve of the questions correct. Note that $150,000 was NOT spent on Palin's clothes, that money was spent on all of the Palin family. The WSJ has an attack on the Zogby poll here. First, it is exactly true that questions about older events should be less likely to be accurate, but Biden's old mistakes should have been discussed at some point during the campaign (so that would be also relevant during the 3 month window the WSJ focuses on) and they were not. The point is that these voters were not well informed, whether it is due to media bias or that the voters were not smart -- the bottom line is the same. Second, the WSJ numbersguy corrects the poll for asking an inaccurate question that was unfavorable to the Democrats, but he doesn't mention similar mistakes were made on the other side (e.g., Palin didn't have $150,000 on clothes for her, it was for clothes for her whole family). Finally, it is very disappointing that Zogby wouldn't redo the same survey on McCain supporters. If that were done, it would (as the WSJ piece implies) put many of the claims to rest. I would bet that if Zogby had done this, he would have found the McCain supporters much more accurate on these issues. It's official. The Interstate 35W bridge fell -- not because of what Tim Pawlenty or Carol Molnau did or didn't do -- but because engineers failed to calculate correctly the thickness of gusset plates more than 40 years ago. The National Transportation Safety Board's findings, released on Nov. 14, must feel like some vindication to Pawlenty, Molnau and MnDOT's bridge inspection and maintenance team. After the collapse, Pawlenty counseled patience. He urged Minnesotans to wait for a thorough investigation before leaping to conclusions about why the bridge fell. Instead, critics launched a relentless -- if often subtly expressed -- search for villains to blame for what we now know was a tragic accident. Sometimes bluntly, sometimes not, critics suggested that Pawlenty's skinflint tax policies and budgets had set the stage for the I-35W bridge tragedy. The governor's opponents maintained that he had sacrificed bridge maintenance and safety -- and thus the well-being of Minnesotans -- in an attempt to adhere to his no new taxes pledge. Sen. Jim Carlson, DFL-Eagan, vice chairman of the Senate Transportation Committee, put it this way after the NTSB issued its report. While Pawlenty "didn't cause [the bridge] to go down," he said, the evidence shows that "very few did something to keep it up." The governor, Carlson added, "really ought to be lowering his head and saying, 'I'm sorry.'" Molnau was the target of particularly vicious condemnation. Critics painted her as an incompetent clown who blithely superintended a bridge inspection and maintenance program that was shoddy, irresponsible and done on the cheap. . . .
My son Maxim and I had a piece last year on this issue here. Just think how much more money Mexico could have made by selling off their oil production to private companies. This from the Associated Press. MEXICO CITY (AP) — America's third-largest oil supplier has exported 17 percent less crude this year. Mexico's state-owned Petroleos Mexicanos company says daily production through October averaged 2.8 million barrels, down nearly 10 percent from the same period last year. Pemex says production has dropped by a third this year at Mexico's main Cantarell oil field. An energy reform package approved by Mexico's Congress last month aims to reverse declining production by giving Pemex more leeway to hire private companies and devote more revenue to explore for oil. Pemex has said production could drop by more than 25 percent in three years without new discoveries.